Natural cleaning or green cleaning is a way to clean your home with fewer cleaning products and safer alternatives - producing less waste and reducing the need for harmful chemicals. Bicarbonate of Soda (Baking Soda) - cleans, deodorises, softens water and is a good scouring powder. White Vinegar - cuts crease and is a deodoriser and mild disinfectant. Pure Soap - is a general purpose cleaner that biodegrades completely. Lemon Juice - is a mild bleach, a deodorant and a cleaning agent. Borax - is a naturally occurring mineral salt. It cleans, deodorises, bleaches and disinfects. Borax is also used to control pests such as ants and cockroaches. 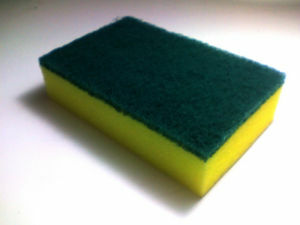 Microfibre Cloths can be used to clean either dry (for dust) or wet (for floors, tiles, glass etc.). All you need to do keep them damp when you use them - also be careful if you pick up grit to rinse it off so you don't scratch the surface, as you would with any other cloth. The mops are great. They can make a much appreciated present for older relatives who like being freed from carrying a heavy bucket of water to mop the floor. Cloth Nappies & Washers are fast and efficient for mopping up spills. They are also very good when used in conjunction with microfibre cloths - both to help dust off grit before using the cloth and to dry the area afterwards. Cloth and elbow grease can get your tiles and grout clean in the bathroom as well. I've been using cloth nappies for 13 years - I'll probably need to replace them in about 2 years. Hardwearing Nylon Cloth with Magnesia Abrasive Particles another tool for cleaning the bathroom with only water. These 'cloths' (which look more like a hard sponge) come in three grades: the softest being for bathroom tiles, the next for external tiles and flagstone, and the hardest for stripping paint etc from external surfaces. They are sold in a plain brown cardboard box with green label at Neco stores. Rags when cleaning a rough job: that is likely to destroy your cleaning cloth, use rags, keep a bundle of clothes unsuitable for resale at op-shops so you always have rags when you need them. Dry the Shower moulds need damp to grow. It only takes a couple of minutes to dry down the shower area after the last person has used it. It also helps get rid of soap scum. You can keep a towel for that purpose in your bathroom. Dispensers for Vinegar and Bicarb use a bottle with a spray nozzle for your vinegar, and a sugar shaker for your bicarb. This will help you to spread the cleaners evenly and reduce the amount you use. Remember using more cleaner is not better - it is just more bicarb and vinegar in the waste water. Less is cheaper both for you and the sewage works: the less chemicals we have in our waste water, particularly paint & salt, the cheaper it is to process. Cleaning is often associated with drudgery, and yes, I admit I would rather read a book. But you can make your cleaning time less awful by cleaning as quickkly as you can while still getting the job done and by listening to the radio, music(a fast beat helps) or a talking book. You can even use your cleaning time as brain in neutral time to think about nothing, or to mull over something interesting you may have read or heard. If you pay for gym membership: think of it as free gym time. Advertising is about selling products so you'll see a lot of ideas repeated in ads for cleaning products: protecting the family from germs, saving time and energy, clean smells, shining home, and without using the actual words reminding you that 'cleanliness is next to godliness'. Naturally, the idea is for you to link the cleaning product in the add with the ideas of 'a quicker and easier clean' 'what a clean house smells like' 'a house you can be proud of' 'taking care of your family and being a good parent'. If it did not work manufacturers wouldn't pay advertisers to make ads. So make your own ads: for example each time you use the bicarb and vinegar to clean the toilet you could think 'It is just magic how this removes all toilet smells withou using harsh chemicals that irritate my nose. And its so cheap!' Find what you like about your choice of green clean products and remind yourself when you clean why you like them: so you have your own positive assoctiation to counter the thoughts such as 'I hate cleaning the toilet - it smells! (until it is clean). Your assoctiations can be as sensible or as silly as you like, after all, cleaning adds have featured little men with suits and wings cleaning the house, and forests and fields of flowers suddenly appearing in bathrooms: so if you like tell yourself that cleaning with mircofibre makes beer taste better, or, people who use bi-carb live in beuatifully co-orindated houses, if it takes your fancy. These are do-it-yourself positive associations with the product - you can tailor them to what makes you smile (or your partner/children groan)so 'I'll just go and use my vinegar and bicarb.. it'll be really quick & easy & so cheap!'. This page was last modified 00:13, 12 July 2009.